The governor of the Dnepropetrovsk region and one of Ukraine’s richest oligarchs, Igor Kolomoysky, has raided the office of oil transportation company Ukrtransnafta in Kiev with the help of several dozen armed “lawyers” in order to regain control over it. Kolomoysky raided the firm to “drive out the new chief from the office and forcefully reappoint his own manager, Mr. Lazorko,” said Sergey Leshchenko, a parliamentarian from the bloc of Petro Poroshenko. Earlier on Thursday, the board of Ukrtransnafta, which manages oil transportation operations through the Ukrainian pipeline network, relieved Aleksandr Lazorko of his post. “The Supervisory Board elected Yuri Miroshnik to act as a Chairman of the Board of Ukrtransnafta from 19 March 2015 until 10 August 2015,” national oil and gas company Naftogaz said in a statement. Lazorko however refused to leave his post, protesting the decision, and barricaded himself in the office until Kolomoysky and his men entered the office and took it by force. The office remains under siege with a number of politicians and MPs trying to argue in Kolamoysky’s favor, calling for the reinstation of the old chief of Ukrtransnafta. According to Vladimir Demchishin, the Energy Minister of Ukraine, a legal team is trying to negotiate with Kolomoysky and his men. The oligarch wants to stall and check the “legality” of the decision to relief Lazorko from his post. Kolomoysky himself left the oil company’s office late evening, carrying some documents. As the oligarch was leaving the building, he told journalists that his legal team found some irregularities that he plans to discuss with the country’s leader Petro Poroshenko. 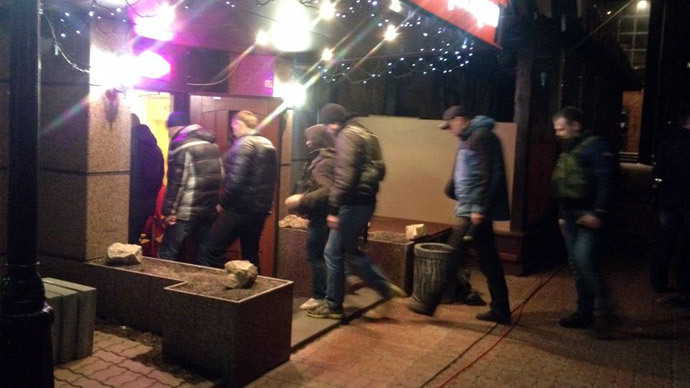 The team of Kolomoysky’s “lawyers” are reportedly still “working” inside Ukrtransnafta’s office. Meanwhile the standoff is “in the process of being resolved,” Demchishin told journalists. The minister spent over 90 minutes trying to deescalate the situation and personally met Lazorko to inform him of the decision to replace him. As for the new appointed head, the energy minister said that under the current circumstances Miroshnik is the right person to conduct a comprehensive audit of the company’s financial dealings. Demchishin earlier complained that Lazorko charged the government twice as much to store the oil through the use of an intermediary. Ukrtransnafta has a monopoly on oil transportation in the country, and is a subsidiary controlled and overseen by national oil and gas company Naftogaz. The company was founded in 2001 and administers the activities of Ukraine’s two main oil pipeline systems: The Pridniprovski oil pipeline and the Ukrainian section of the Druzhba pipeline. Kolomoysky is one of the richest men in Ukraine with an estimated wealth of up to $6 billion. According to Forbes his net worth is $3bn. The businessman’s fields of activity range from ferroalloys to finance, to oil products and mass media, as well as metal and petroleum industries. Some of his wealth is rumored to have emerged from numerous hostile takeovers of his competitors. Amid, last year’s coup and the turmoil surrounding it, Kolomoysky used his wealth to secure political power. Then-acting President Aleksandr Turchynov appointed him as a governor of Dnepropetrovsk region. The 52-year-old oligarch used his newly gained powers to stem the so-called “Russian influence” in his region. Kolomoysky also is believed to have spent millions to create the ultra-nationalist Dnipro Battalion. Basically forming his own personal army, Kolomoysky has also been funding the Aidar, Azov, Dnepr 1, Dnepr 2, and Donbas volunteer battalions, that have been accused of carrying out mass atrocities. For instance, members of the Aidar Battalion “have been involved in widespread abuses, including abductions, unlawful detention, ill-treatment, theft, extortion, and possible executions,” according to Amnesty International. In Russia the oligarch is sought for “organizing the killing of civilians,” after last July a Russian District Court authorized his arrest in absentia. Russia has been trying to get the oligarch placed on Interpol’s wanted list.